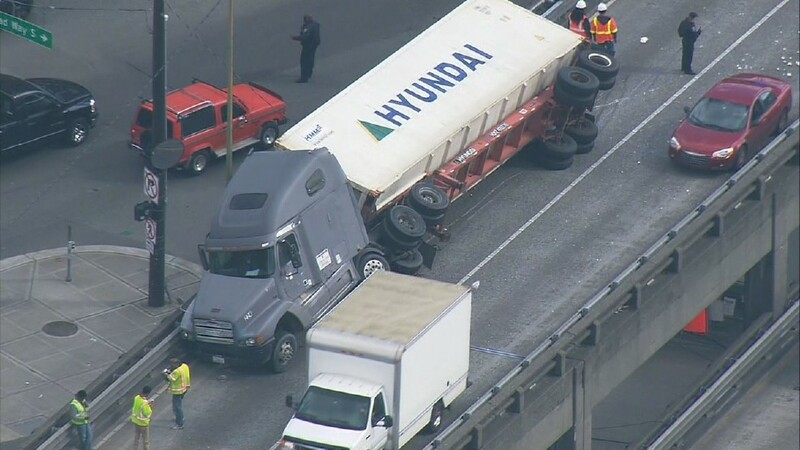 A semi truck that crashed on the northbound Alaskan Way Viaduct has stalled traffic as emergency responders try to clear the scene. No injuries have been reported as a result of the crash. One lane remained open shortly after the collision, but transportation officials were warning drivers that the viaduct could be closed completely if it is judged too dangerous to remain open. According to the Seattle Department of Transit, the northbound lanes are now subject to closure. Video and photographs from the scene appear to show damaged concrete and a trailer teetering precariously off the edge of the viaduct. The guardrail appears to have been damaged as well. Police have not yet told reporters whether they have any suspicions as to the cause of the semi-truck crash. UPDATE: NB Alaskan Way viaduct is subject to closure. Please use alternate routes.